At 1:55 a.m. EDT (0555 UTC) on Oct. 3 the MODIS instrument that flies aboard NASA's Aqua satellite gathered infrared data on Leslie. Infrared data provides temperature information. Strongest thunderstorms were fragmented as they circled the center and were in a thick band northeast of center where MODIS found cloud top temperatures as cold as minus 63 degrees Fahrenheit (minus 53 Celsius). NASA research has shown that cloud tops with temperatures that cold were high in the troposphere and have the ability to generate heavy rain. The National Hurricane Center or NHC noted "Deep convection surrounding the center of Leslie has become better organized overnight, with the development of a ragged eye in infrared satellite images." A microwave image revealed a well-defined low-level eye with a ring of broken convection surrounding it. 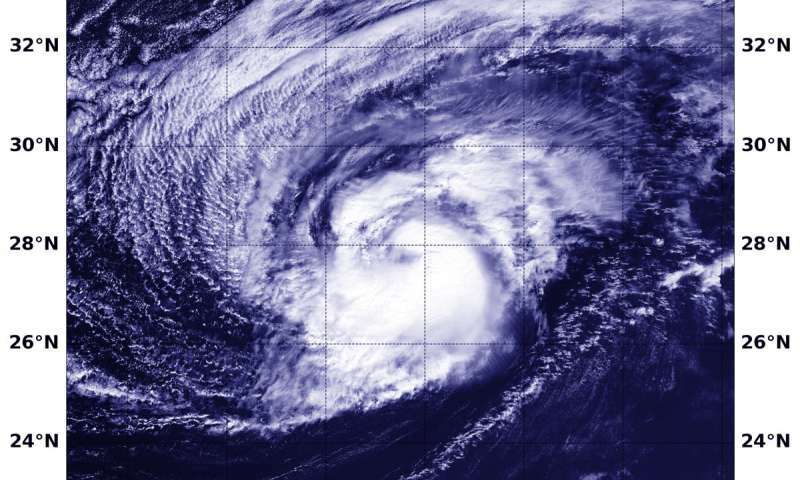 At 5 a.m. EDT (0900 UTC), the center of Hurricane Leslie was located near latitude 29.6 degrees north and longitude 56.9 degrees west. That's about 505 miles (810 km) east-southeast of Bermuda. Leslie is nearly stationary, and little motion is expected today. A northward motion is forecast to begin tonight, and this motion should continue through Friday night. Maximum sustained winds have increased to near 75 mph (120 kph) with higher gusts. Some additional strengthening is forecast during the next day or so. NHC noted "The hurricane is forecast to remain within favorable environmental conditions consisting of warm water and low vertical wind shear over the next day or two. These conditions should allow for some additional strengthening."